Chrysler had long sought a spot in Northeast Ohio to build a stamping plant. Brooklyn, Copley, and Macedonia had been front-runners for the plant at one time or another, but Twinsburg was projected as the most profitable. The site previously considered the favorite in Macedonia turned out to be quite problematic; the soil conditions were considered unstable and not fit for construction of a massive stamping plant. 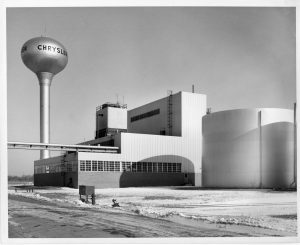 In November of 1955, it was decided Chrysler would build a two hundred-acre plant in Twinsburg at an estimated cost of $85 million dollars. The plant was built on land purchased from the family of future Twinsburg mayor, James Karabec. According to an article appearing in the Plain Dealer on February 17, 1957, nineteen Ohio cities and thirty firms shared in building the Chrysler plant, accounting for the bulk of materials used. Thousands of workers across the state contributed to the plant’s construction with contracts awarded to companies ranging from a few thousand to millions of dollars. Three orchards and four houses came down to let bulldozers dig the plant foundation. Bedrock was fourteen feet below ground, close enough to brace presses that would reach 600 tons in weight with a stamping force of 1,800 tons. This massive structure was located on Township soil, but the recently seceded city of Twinsburg annexed the land and property. The greatest catalyst for growth within the City of Twinsburg was the arrival of Chrysler. “The city built up because of Chrysler…that economic impact and the freeway 480 coming through here is what drove Twinsburg to develop. It provided jobs. It provided economic income for the city,” according to Mayor Procop. The opening of the stamping plant was cause for celebration. Nearly 1,000 of the 3,600 Twinsburg inhabitants braved blustery, winter weather to greet the great new employer of the masses at their groundbreaking ceremony. Chrysler was the employer and generator of tax revenue for Twinsburg, at one point accounting for 75 percent of tax revenue. At its peak it employed around five thousand people (more than the population of Twinsburg when Chrysler first arrived). The plant employed people from as far away as Pennsylvania and Michigan. Glenwood Acres, a neighborhood comprised of 431 affordable houses, was constructed to house the influx of new arrivals to the area. Over the course of the plant’s fifty-three year history there were numerous alterations in the methods of automotive assembly. As described by long-time employee Dale Franks, the plant in the mid-1980s was “rough…smoky, dirty, nasty.” By the time he left in 2006 it was “very clean”. When the plant was first built most of the labor was manual. Little-by-little robots became commonplace. The first A.I. employee was a small welding robot. After the introduction of the first robot there was more automation every year and less employees. “They [the robots] did displace people on the lines,” said Randy Addison, a thirty-eight year employee at the plant. “When I was there, door line would take eighty people. When I retired door line would take eight people.” Addison and many other employees were sent to Detroit to take classes on how robots worked. The plant’s production was thoroughly concentrated on constructing car doors. For the vast majority of the plant’s lifespan production was phenomenal, as was the interpersonal relationships between employees. Dale Franks has described his former fellow Chrysler workmates as “family.” But all was not rosy at the stamping plant. Excruciatingly long hours (often eighty hour weeks and very few days off) lead to employee discontent. There were a number of shootings and drug busts at the plant through the years, but possibly the most heinous act occurred in 1967 when a wooden cross was burned at the union hall. A lynch rope and a KKK sign also appeared in the plant. Racial tensions were running high amid concerns about poverty and problems in Twinsburg Heights, which was adjacent to the plant. Strikes at the Twinsburg stamping plant and in Michigan greatly affected employees across the country. A strike at one plant would ripple through the company, causing layoffs at various other plants as production slowed. In November of 1983, 3200 United Auto Workers Local 122 members employed at the Twinsburg plant went on strike for a mere five days. The effect of the strike was widespread and considerable costly—half dozen assembly plants closed and twenty thousand workers were cut loose. Losses for the automotive superpower were estimated at $75 million. In 1967 a strike at Chrysler Auto Plants in Michigan “forced” the corporation to lay off five hundred Local 122 employees. On the brighter side, if not for Chrysler Kent State University (KSU) would not have a presence in Twinsburg that it has today. In 1991, KSU opened a training center at the plant, to offer classes in business management, industrial trades, computers, quality certification and general education. It was the largest stamping plant for any automotive corporation in the world, right up to the time of its demise. Talks of closing Chrysler plants were rampant in early 2009, even though Chrysler filed for Chapter 11 bankruptcy protection. An announcement was made that no more plants would be permanently closed. It looked as if the Twinsburg plant was safe. Instead Chrysler broke their promise, closing five more plants, including Twinsburg, on the same day their empty promise had been made. Union employees, state legislators, and local government officials were caught off-guard by the abrupt decision to shut down the plant. “President Obama forced Chrysler into federal bankruptcy protection on Thursday so it could pursue a life saving alliance with the Italian automaker Fiat, in yet another extraordinary intervention into private industry by the federal government. Flanked by his automobile task force of cabinet secretaries and business advisers in the White House’s grand entranceway, Mr. Obama announced a plan that would allow the United Automobile Workers, through their retirement plan, to take control of Chrysler, with Fiat and the United States as junior partners. The government would lend about $8 billion more to the company, on top of the $4 billion it had already provided,” according to a New York Times article published on April 30, 2009. It seems the federal government saw fit to bail out a billion dollar corporation, but not the city of Twinsburg. Mayor Katherine Procop mentioned the company’s chief executive and several administration officials talked about bright futures for Chrysler cities, during conference calls the week prior to the permanent closings. “I feel so disheartened because I had been meeting with the UAW and with the management of the plant” discussing Twinsburg‘s future, Procop said, “To find out that we were on the chopping block from the very beginning, that goes beyond disbelief”. In fact, she was not even alerted by Chrysler brass about their decision to close, instead an early morning call from an AP reporter informed her of the decision. There was a great fear the closed Chrysler plant would remain vacant for a substantial duration of time, creating an eyesore and continue to detrimentally affect the local economy; however in July 2011, the Plain Dealer reported two companies, “The DiGeronimo Cos. of Independence and Scannell Properties, based in Indianapolis, purchased the automotive complex for an undisclosed price.” Plans were set from the new owners to tear down sixty-five percent of the 2.2 million square foot plant. Posted in Commerce and tagged Chrysler, Chrysler Plant, Procop, Katherine.